Let Bannister Moving & Storage Take You Home! 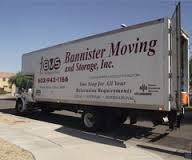 Bannister Movers is a Phoenix moving company that began moving families in the late 80s and still maintains the small company feel and old mentality of doing business. Remember when you could shake a person's hand to do business? Remember when your word meant something? Remember when the owner knew your name, your family, and your life aspirations? Although times have changed, our professional staff will treat you like our own family at all times. Every single one of our customers is valued and their business is appreciated. We tailor your move to your specific needs, your specific lifestyles, and your specific requirements. This and our long history of experience, has granted us the pleasure of having a prestigious reputation as a premier Phoenix moving company. No matter what propelled your move, no one will care about and protect your treasures like Bannister Moving & Storage. We constantly scan the market for new ways to do business, all without forgoing what is paramount to us - Customer Satisfaction.